It has been one of the most talked-about topics among seniors. In addition to the usual panic over career placement, moving and who to send graduation announcements to, we have all been wondering who will speak at this year’s commencement. The commencement organizers decided to give us … (drumroll, please): our own President Sample. Oh yes, the university really had to stretch its networking contacts in order to bring us our very own president to give the parting words to the 2010 graduating class. To be fair, it makes sense for Sample to be given the chance to speak, since this is his final year at USC and he has racked up an astounding number of accomplishments while devoting his life and energy to this school for the last 19 years. But it doesn’t take away from the disappointment that comes with this announcement, considering how highly it was anticipated. In the past, USC has been among those enviable colleges that consistently recruit celebrities and other impressive name-brand speakers to send our newest alumni out into the world. As the Daily Trojan reported on Tuesday, former speakers include Gov. Arnold Schwarzenegger, Ted Koppel, Neil Armstrong and Bill Cosby. It seems, however, that we have joined the group of primarily smaller schools who focus on finding someone dependable rather than flashy, to make a well-rounded (albeit usually generic) speech about the rewards of hard work and the thrills of the unexplored road ahead. The general senior consensus on Sample seems to be one of dissatisfaction. We only graduate from college once; we want it to be as special as it has been for students in the past. It is not as if the university lacks a long list of “very important persons” to contact. The film school alone has enough star-studded alumni to fill the Shrine Auditorium; couldn’t the organizers have given Uncle George (Lucas) a ring? The news is even more disheartening considering the impressive speakers that will be attending other college’s graduation ceremonies. Yale snagged Bill Clinton; Harvard landed former Supreme Court Justice David H. Souter; Jeffrey Immelt, CEO of General Electric, will speak at Hamilton College in Clinton, N.Y.; and actor Danny Glover is traveling all the way to Logan, Utah, to visit Utah State University. Granted, it was easy for seniors to get carried away with our list of speaker hopefuls. Names such as Oprah, Steve Jobs and Hillary Clinton were tossed around, though these expectations were pie in the sky. We all knew that there was no way Barack Obama would be coming to Los Angeles to talk to seniors on a smoggy summer morning, but many seemed to secretly hope that someone almost equally as impressive would grace us with their presence. In fact, the president will be addressing the class of 2010 at both the University of Michigan and Hampton University. Additionally, the first lady will be speaking at George Washington University. Michelle Obama challenged the students to complete 100,000 hours of community service in exchange for her attendance at commencement on May 16, a mission they accomplished just last week. Graduation is such an important milestone in a person’s life. Commencement is a day that marks the beginning of our futures, our entry into adulthood. The speaker is charged with the task of bestowing some enlightening anecdotes and advice to graduating students while simultaneously entertaining their visiting friends and relatives. resounding speech. He is well-regarded for his inspiring presence and is sure to deliver a message worthy of his send-off. In fact, many students, while disappointed in his lack of star power, are indeed excited by the announcement. However, it remains unsatisfactory that we weren’t able to secure a more exciting public figure like we’ve had in years past. After all, we’re USC; we tend to hold a bit of clout among the collegiate set. Surely we could have booked someone who would have granted us some bragging rights among our friends from high school. The best way to satisfy the demands of the student body would be for the university to grant seniors some participation in determining their commencement speaker. Ballots should be available online at the beginning of the year where students could list their ideal speakers, and the university would try to contact the most popular recommendations. Even if the proposed candidates were unavailable, students would at least feel like they had some say in determining whose speech they would sit through at the end of the year, making it a more personal selection process. To be honest, at the end of the day, most students will probably barely even remember the commencement speech, since they’ll still be rubbing the sleep from their eyes after their early wake up. But perhaps if someone more notable walked up to the podium that morning, the speech would not be so easily forgotten and the students’ grogginess would instead give way to excitement. Amy Baack is a senior majoring in cinema-television production. 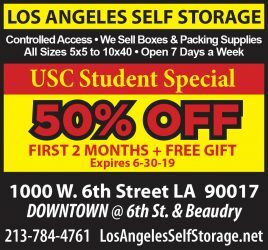 For all of USC’s bragging about becoming a top school, the pride, (and well warranted), the excitement, how it is now more difficult to get into than ever, more applicants than ever, competing with big name schools and now top on lists, etc etc etc..and ‘global’, expanding, more international students, study abroad, etc. etc. etc., the choice of Sample as speaker for commencement is such a contradiction to that, it just seems so ‘small town’ and ‘insular’ for where this school is now….yes, he is partly responsible for that, but have a special DAY to honor him, have a special WEEK for him, with tributes in his honor to give HIM the send off HE deserves..but commencement is for THE STUDENTS… no one is saying he has not done an amazing job and just about everyone recognizes that..so honor him at commencement, but not have him as the guest speaker, when most have heard him speak many times over at school through the years. And he is a wonderful speaker.. but this is the students day. If USC is indeed up there with the other famous world renown schools then why not have guest speakers on the level those schools have? Not just some ‘celeb’, but someone OUT THERE in the WORLD, outside of the school, who has accomplished things BEYOND USC, since the hope is that our graduates will have many accomplishments BEYOND USC..I think Sample has done an amazing job. I also think he should recognize this as a once in a lifetime event for the grads, and should have been a big man, and been willing to step aside and give them the send off they deserve. Or all the bragging, all the notices sent to homes and e-mails regarding how great USC has become, pale, if the class graduating, at what seems to be the height of that rise, can’t have a world renown speaker of note on their commencement day, as other top schools have. . It seems that everything at USC has GROWN, except in this area. This area has now, this year, gotten SMALLER…If there was a committee in charge of seeking out and booking a speaker for this special day they should all be replaced, as this was not only a huge oversight, a big mistake of judgment, but seems to be laziness, taking the low road, in the extreme. Or was it University POLITICS, which would be very sad as it is the graduates who suffer …The students have been encouraged to ‘go for it’ to think big, think global, expand themselves in their years at USC, just as the school has done.. and then they get the easiest choice to speak at their graduation…and the grads, who have worked so hard, and have been so committed to, and proud of, the greatness of their school, deserve better on THEIR very special day..not the President’s day, not the Alums day, not the UNIVERSITY POWERS THAT BE day, but THEIR day. As a current sophomore, I think the class of 2010 should feel honored they get to hear Sample speak for perhaps the last time at a USC graduation ceremony. As a graduate of USC, I cannot remember who our commencement speaker was. However, if it had been Dr. Steven Sample, I would have never forgotten and would have forever been proud to say he addressed our class. 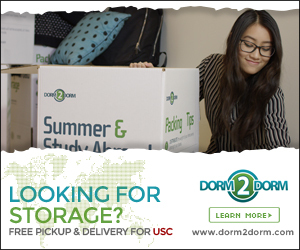 Sample has turned USC into a top-ranked university which ultimately makes every diploma more prestigious and our students more marketable. We should all be grateful for the time, energy, and commitment he has given to the students and community of USC. Leave Amy alone. Her article reflects the views shared by lots of people, not just her. All of us are incredibly grateful to President Sample for his tireless work on behalf of USC. But President Sample speaks EVERY YEAR at graduation. He also speaks THROUGHOUT THE YEAR. We have ALREADY HEARD HIM. A better programming decision would be to honor Sample and also let someone ELSE speak. Amy, like many other USC grads including me, just wants to hear someone who has been successful in a place OTHER THAN USC. This writer has her priorities mixed up. She appears more enamored with shallow celebrity and name recognition than with excellence. What a shame. Dr. Sample is one of the most gifted and inspiring speakers I have ever heard. How lucky USC has been to have been the focus of his talent and genius for so many years. 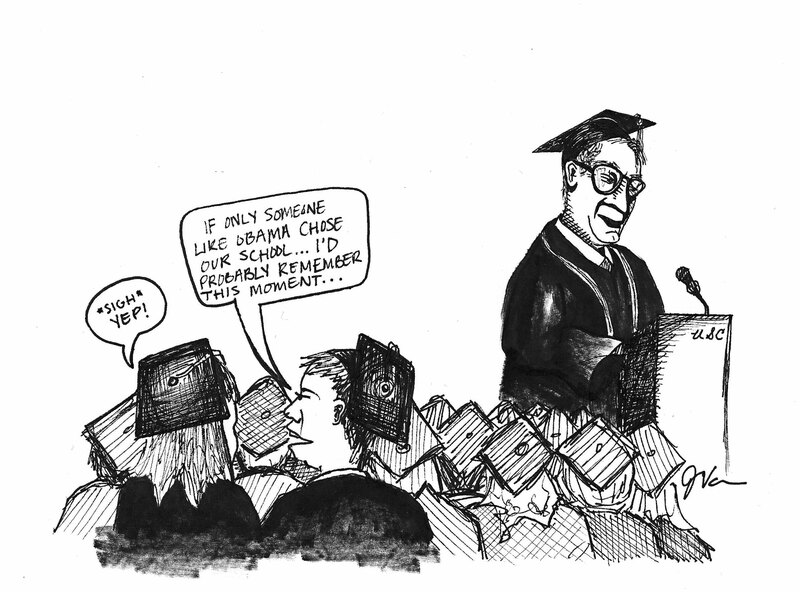 The graduates will undoubtedly long remember what he says at their commencement. More importantly, the graduates would be better served to remember what they learned during their years at the University. This writer needs to re-think what constitutes her entry to adulthood. This article is an embarrassment. President Sample has been the driving force behind USC’s rise to academic excellence over the past decade. He might not be the flashiest, or most well-known Commencement speaker to those outside of the wall of the University, but he’s going to provide an insightful, intelligent and motivating speech. I only wish my graduating class of ’06 would have been able to listen to Sample – Instead we got Mayor Villarigosa, who is much more well-known among Angelenos, yet was unable to provide us with anything tangible to hold onto once we tossed our caps into the air. I never realized that commencement addresses only existed so we could brag about them to our high school friends. The speech will be good no matter who gives it, and I for one applaud the choice of Steve Sample. He’s helped raise USC to it’s current high standing, and his speech will no doubt have the same wisdom and tact that Sample has shown through his presidency. honestly, I’m not too invested in who’s speaking — but it kind of feels like yet another tribute to Sample leaving USC — 2010’s senior class is, too! as a stepping stone in his quest for power & fame & glory. Only weaklings admire such pathetic “humans”. tjay, you’re low class. Get over it. …I wish we had Obama for our speaker. Honestly, It’s very disappointing to see the DT take this stance, and I agree with USC Alum. This is a college graduation – not the red carpet. Steven Sample has done amazing things for this university, and many students have never even seen him in person – much a less had a chance to hear him speak. Yes, maybe his name isn’t always in the limelight – but his actions and choices have affected both the school, and yes, the world. Petty complaints aside, Sample is a perfectly capable orator. A commencement speech should not be about “bragging rights” – it should be a reflection of the college and a reflection on the global journey that you seniors face. Why does your list of “stars” entirely consist of famous ultra-liberals? (Clinton, Obama, Oprah, Souter, the list goes on…) And movie stars! You want a movie star to give a commencement speech? How about hearing from somebody who has actually ACCOMPLISHED something? Steven Sample is the best commencement speaker I’ve heard USC select in YEARS. He is part of the Trojan Family and has spent the last 20 years shaping our educations based on what he believes we need to learn in order to be competitive in the world. I’m very interested to hear what he has to say. What ten-year-old came up with this idea? Amy, you need to hear a speech from an “impressive” speaker like Danny Glover or Oprah to make your graduation day special?? After four years at USC, you haven’t learned a thing about what is truly important in life, have you? I hope you do not represent the rest of your class. President Sample has raised the level of prestige of that diploma you will be holding to incredible heights and yet you want to hear Oprah make jokes about pomegranate martinis. Get a life, girl. Maybe we need to re-evaluate our definition of who qualifies for “star power.” At some point the graduates will realize the real stars in the world are not the few that make the news everyday, but those that work tirelessly, behind the scenes for the good of many of us. Quit complaining! USC doesn’t always get superstars to do commencement speeches. When I graduated waaaay back in 1994, the speaker was none other than George Olah! Oh wait, his name doesn’t ring any bells? Well, the same “outrage” was printed in the DT and heard throughout the student community at that time. He was (maybe still is) an SC professor in Organic Chemistry who was awarded a Nobel prize that year. He was a perfectly competent speaker, but honestly I don’t remember what he said. In 6 months you won’t even care, so let it go. Live with it, enjoy your graduation, and get on with your life! Congratulations to all soon-to-be graduating Trojans! Fifth paragraph from the end of this article, – “After all, we’re USC;….”. 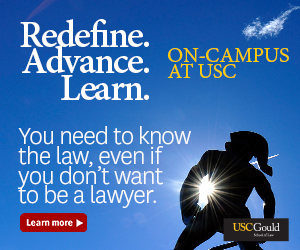 I do believe USC students have Steven Sample to thank for this. And, by extension, I believe that USC students have Steven Sample to thank for the fact that graduates will always want to say, “Hey, I’m a USC alum!” . Listen carefully at commencenment. I am sure he will teach us something that will last a lifetime.